The Independent Systems Operator (ISO) for New England has a tough job. It works to ensure the reliability of electric power for all of New England. I recently wrote about electric power network modeling. Today's Boston Globe has a nice article on ISO New England that quotes Dr. Vamsi Chadalavada. In the article, the importance of weather forecasting is noted as well as demand management when the need for electric power, as we had recently due to the heat, gets too high. My daughter personally experienced the demand management when she was sent home early from her summer job last Friday because her school, where she is working, agreed to reduce power use by shutting off the air conditioners. We had the pleasure of hosting Dr. Chadalavada as well as Mr. Richard Brooks in our UMass Amherst INFORMS Speakers Series. Mr. Brooks spoke on smart grid development whereas Dr. Chadalavada gave us an overview of New England's power system and markets. As for some of the challenges and opportunities regarding the smart grid, a summary of the highlights of Mr. Brooks visit and talk at the Isenberg School can be found here. INFORMS (The Institute for Operations Research and the Management Sciences) organizes a series of colloquia in conjunction with its annual meeting, which, this year, will take place in Charlotte, North Carolina in mid-November. The colloquia options are for Teaching Effectiveness to which tenure-track or even tenured faculty can apply, as well as two for doctoral students: Future Academician and Future Practitioner. One can obtain so much valuable information from taking part in these organized colloquia and they also provide excellent opportunities for networking. The deadline is tomorrow, July 30, 2011. I have had many of my doctoral students take part in the colloquia over the years and they have all very much enjoyed them. More information can be found on the INFORMS conference website here. I am very much looking forward to the Integrated Risk Management Conference in Operations and Global Supply Chains that begins this weekend at McGill University in Montreal, Canada. This conference is being organized by Professors Mehmet Gumus and Saibal Ray and is co-hosted by the Desautels Faculty of Management, McGill University, and the Olin School of Business, Washington University in St. Louis. According to the conference announcement, this two-day conference features a single track of fourteen talks and six poster presentations that combines technical presentations, industry practices, and discussions on relevant challenges and approaches in the topic area. Detailed information about the conference can be found here with the conference program located here. Those who would like to attend the conference can register before July 30, 2011 (at no registration fee since it is covered by the conference sponsors). I will be speaking on Medical Nuclear Supply Chain Design: A Tractable Network Model and Computational Approach, co-authored with Professor Ladimer S. Nagurney (my husband, who has a PhD in physics). Our presentation is based on the paper that we recently wrote. This health care topic was also the subject of our published Op-Ed piece. This has been an amazing week. As readers of this blog know, I have been awaiting a confirmed announcement from Deutsche Bank about one of our graduates, Anshu Jain, who received his MBA from the University of Massachusetts Amherst in 1985. Now it is official and Deutsche Bank has announced in a press release that Dr. Josef Ackerman, who has been at its helm for 10 years, is retiring and co-chairmen have been selected: Anshu Jain and Juergen Fitschen. As my colleague in the Finance and Operations Management Department, Professor Sanjay Nawalkha, who is now in India told me, Jain's selection has been front page news in India (and, I expect, will be at least front page business news soon in the US). You can read more about Mr. Jain here. Also, Hina Rabbani Khar, a graduate of our Hospitality & Tourism Management Program, was last week sworn in as Pakistan's Foreign Minister (essentially Pakistan's Hillary Clinton). She is this country's first female foreign minister and, at age 34, its youngest. You can read more about her here. The media in the Asian subcontinent has been heavily covering her appointment to this high position. The Isenberg School of Management houses seven departments: my Department of Finance and Operations Management, the Accounting Department, the Management Department, the Marketing Department, as well as the Sports Management Department, the Hospitality & Tourism Management Department, and the Resource Economics Department. It is under the leadership of Dean Mark Fuller, who became our new Dean on August 1, 2009. He is also the holder of the Thomas O'Brien Endowed Chair (named after our long serving Dean whose hard work resulted in the naming and expansion of our School of Management). Wow -- now that was a great talk! I have heard such a comment after numerous speaker presentations organized through our UMass Amherst INFORMS Student Chapter. Many, from faculty to students to practitioners, over the years, have commented that these talks, which we schedule on Fridays, with lunch and further discussions to follow, were the highlights of their week. In organizing a semester's worth of talks, we looked for speakers who could inform and educate a wide audience on timely topics of interest to the operations research / management science community. We also availed ourselves of the INFORMS Speakers Program and I personally have greatly enjoyed being a speaker in this program, and have given talks in Dallas, Pittsburgh, and other locations, as a result of it. I especially enjoyed the mix of the audience participants from various industries and universities and the wonderful questions and hospitality of the INFORMS Regional and Student Chapters that have been my hosts. 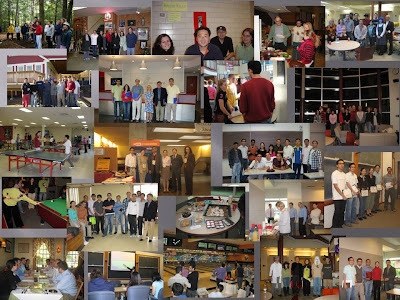 My professional and social networks have also grown from participation in this valuable program. This year I have the pleasure of chairing the INFORMS Speakers Program Committee, with committee members: Dr. Tim Lowe of the University of Iowa and Dr. Les Servi of MITRE. We are working on enhancing this program by adding new speakers and expanding the program geographically and making it more diverse. We also hope to include more video resources and to enable speakers to edit their profiles. Do stay tuned as we expand this valuable and exciting resource. The next issue of OR/MS Today coming out in August will include a profile of the INFORMS Speakers Program and some of the advantages of using a speaker through the program. As for tips on how to run a successful speakers series, read more here. 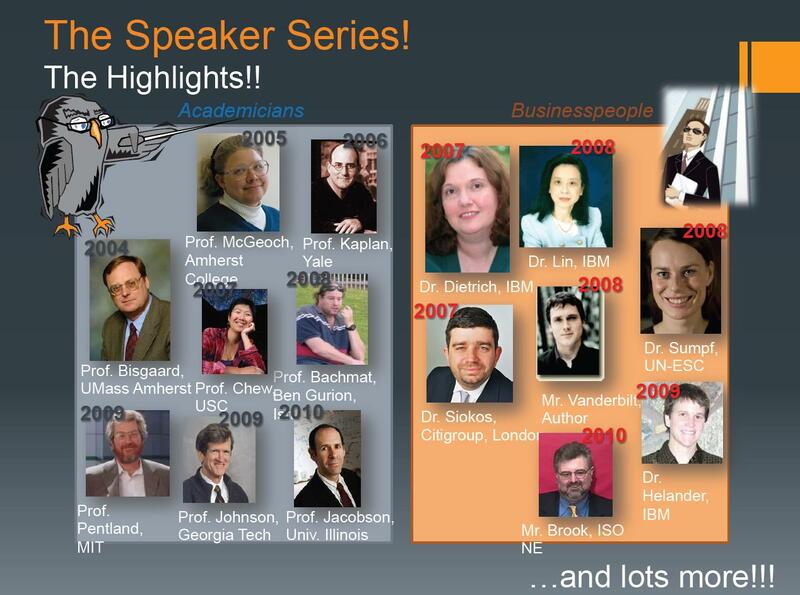 I leave you with some photos above of several distinguished speakers who have graced our Speaker Series at UMass Amherst who are part of the INFORMS Speakers Program. I am sure that you can recognize them but, just to make sure, the above photos are of the visits of Professor Richard Larson of MIT, of Professor John Birge of the University of Chicago, and of Professor Sheldon Jacobson of the University of Illinois Urbana/Champaign. Thanks to all the speakers in our profession who take the time out of their very busy schedules to come and speak on our campuses and at other sites -- from corporations and beyond! Wherever you are located in the United States, you are most likely enduring record-breaking temperatures. These record-breaking temperatures are putting extreme pressures on the generation of electric power due to the demand for running air conditioners, fans, etc. In the area that I live in, the Pioneer Valley of Western Massachusetts, yesterday was the second biggest drain on electric power ever in the region, according to ISO New England, the Holyoke-based company that operates the electric power grid for the six New England states and ensures its reliability. Interestingly, other high demand days occurred in the summer of 2006 and that is exactly the data that Dr. Zugang Liu, now of Penn State University at Hazleton, and I used to develop our electric power supply chain network model, using data from ISO New England. The study, An Integrated Electric Power Supply Chain and Fuel Market Network Framework: Theoretical Modeling with Empirical Analysis for New England, was published in the journal, Naval Research Logistics 56: (2009) pp 600-624. Specifically, we constructed a novel electric power supply chain network model with fuel supply markets that captures both the economic network transactions in energy supply chains and the physical network transmission constraints in the electric power network. The theoretical derivation and analyses were done using the theory of variational inequalities. We then applied the model to a specific case, the New England electric power supply chain, consisting of 6 states, 5 fuel types, 82 power generators, with a total of 573 generating units, and 10 demand market regions. The empirical case study demonstrated that the regional electric power prices simulated by the proposed model very well matched the actual electricity prices in New England. We also computed the electric power prices under natural gas and oil price variations. The empirical examples illustrated that both the generating unit responsiveness and the electric power market responsiveness are crucial to the full understanding and determination of the impact of the residual fuel oil price on the natural gas price. Finally, we utilized the model to quantitatively investigate how changes in the demand for electricity influence the electric power and the fuel markets from a regional perspective. which deregulation is taking place. Moreover, the general framework can also be used to assess new redesigns of the electric power grid, a topic, a fellow Brown University alum, Matt Wald, recently wrote on in The New York Times. Problems to research are all around us -- now more than ever. All that one has to do to identify the important and interesting problems in order to help make the world a better place, is to keep one's eyes open and to observe; to read a lot -- news, journal articles, and books; to communicate with others, through both local forums, as with students and colleagues, through conferences, email, social networking, etc., and to experience life. Travel helps, as well, in order to view the world outside of the silos and to better understand what are the major issues. Successful research, however, requires incredible focus, dedication, and passion, and a book that captures the life of an amazing researcher and scientist, like no other, is Madame Curie, a biography of Marie Curie, written by her daughter, Eve Curie. I decided to read this beautiful biography of Marie Curie this summer, after hearing that Alan Alda (yes, of M*A*S*H* and other fame) had written a play about her that was performed at this year's World Science Festival (WSF) in early June in NYC. Coincidentally, Alda, also around that time, even managed to give a commencement address at a local prep school in our area, from which his granddaughter was graduating. I feel as though Madame Curie was inspiring me throughout this summer, with a nudge from Alan Alda who loves science and has been an active proponent of the WSF (I had the terrific experience of speaking on the Traffic panel at the 2009 WSF). The WSF is the brainchild of Dr. Brian Greene, a renowned physicist at Columbia University, and his wife, the journalist, Tracy Day. This summer, coincidentally, after purchasing the Curie biography, I became absolutely fascinated by medical nuclear supply chains and the shock that the US has not even been producing nor processing the most commonly used radioisotope for cancer and heart diagnostics led me to do research on this critical supply chain. But, I needed a collaborator who was skilled in the underlying physics and, luckily, my husband has a PhD in physics, with a concentration in low temperature experimental physics, and we needed to get the news out, which we did through an Op-Ed piece, along with the paper, Medical Nuclear Supply Chain Design: A Tractable Network Model and Computational Approach, Anna Nagurney and Ladimer S. Nagurney, which I will be presenting at a conference at McGill University in Montreal next week. As noted in our paper, since molybdenum decays with a 66.7 hour half-life, approximately 99.9% of the atoms decay in 27.5 days, making its production, transportation, and processing all extremely time-sensitive. In fact, its production is quantified in Six-day curies end of processing denoting the activity of the sample 6 days after it was irradiated to highlight this (and, yes, named after the Curies). Note that not only did Marie Curie receive a Nobel prize but she actually received 2, in Physics and in Chemistry, and shared the former prize with her husband, Pierre Curie, and with Becquerel. In our nuclear medical supply chain paper, we needed a theoretical result (our model is a generalized network optimization model in which the arc multipliers capture the various losses due to radioactive decay, etc.) in order to be able to obtain an elegant formulation for analysis and computations. Propitiously, and this also speaks to passion as being a necessary condition for good research, one of my doctoral students, who is very interested in health care, and another doctoral student, who is researching time-sensitive product supply chains, began working on blood supply chains. Our paper, Supply Chain Network Operations Management of a Blood Banking System with Cost and Risk Minimization, Anna Nagurney, Amir H. Masoumi, and Min Yu, has now been accepted in the journal, Computational Management Science, and it contains a result that we needed in both in our medical nuclear supply chain modeling work as well as in a followon paper, Supply Chain Network Design of a Sustainable Blood Banking System, Anna Nagurney and Amir H. Masoumi, to appear in Sustainable Supply Chains: Models, Methods and Public Policy Implications, T. Boone, V. Jayaraman, and R. Ganeshan, Editors, Springer, London, England, 2011. On an ending note, Marie and Pierre Curie's other daughter, Irene Curie, and her husband, also were awarded the Nobel prize in chemistry. Amazing accomplishments and among members of two generations of a family. This month's INFORMS blog challenge is on O.R. and Social Networking and this post is my contribution. I believe that some of the best educational experiences take place outside of the classroom, and that having students interact with luminaries in the field as well as with one another, with faculty, and with practitioners greatly enhances their learning and knowledge. Of course, such experiences can happen in a more or less ad hoc fashion, but it is special when there is a common forum and a sense of community. 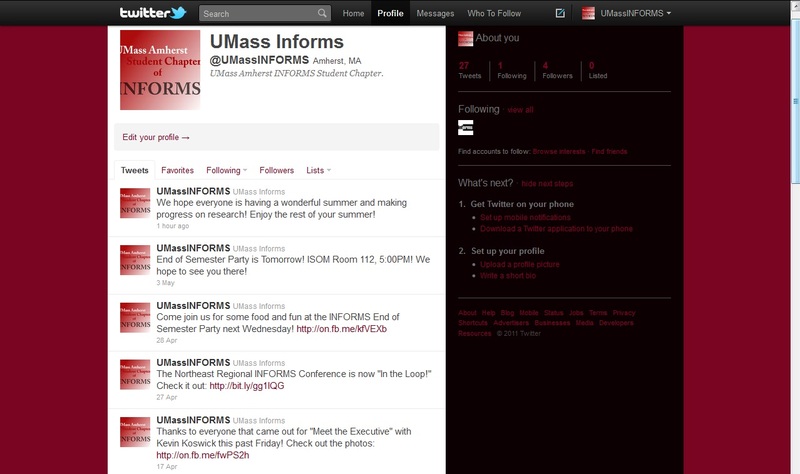 At UMass Amherst, I have served as the Faculty Advisor to its INFORMS Student Chapter since September 2004. This chapter, through the excellent work of its officers, elected each Fall, and its members, organizes activities each semester, ranging from speakers, to excursions, to social activities, from parties to ping pong tournaments and bowling nights, some of which have become annual events, and help to mark the progression of the academic year. A highlight (and unique event, thus far) was the First Northeastern Regional INFORMS Conference that took place at UMass Amherst, May 6-7, 2011, for which the student chapter members provided essential support and assistance (thanks). Also, several of the present and former officers spoke on a panel, How to Run a Successful INFORMS Student Chapter. and offered some great advice. Essential to the building of a community is to make sure that everyone is informed about the chapter's activities. This we accomplish through the use of social networking tools from Facebook and Twitter, through which we disseminate news about our upcoming activities and such communications help to keep our members feeling connected to the chapter. 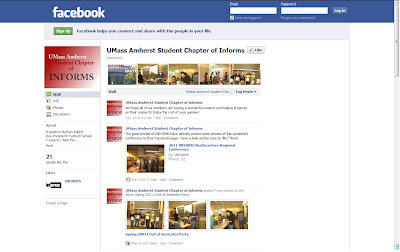 Our chapter Facebook page provides a nice historical timeline of what has been happening over a given year and the students enjoy our tweets as well. The officers also send out regular e-mail news announcements and construct fliers for upcoming activities, plus they regularly update the chapter's website. 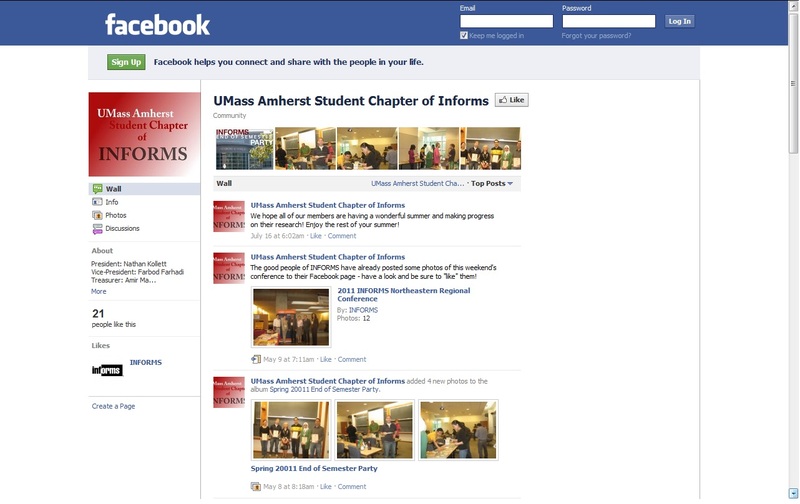 Postings also take place on the Isenberg School's events page and, quite often, also on the UMass Amherst events page (and even homepage). Even after the students graduate, the social network that they have established through this chapter lives on and enriches their personal and professional lives and careers. When the US government is moving too slowly, it is good to see that some companies are acting responsibly and moving forward on food safety. Costco is one such company and it is requiring that its produce suppliers test all of the bagged produce sold at Costco. It is also testing all of its beef at its warehouses for E.Coli (all the strains that it can possibly test for). This heightened awareness is coming from the food poisoning events, due to E. Coli contamination, that happened over the past few weeks in Europe, and that I have written about, which resulted in thousands of illnesses and dozens of deaths, primarily in Germany, attributed, in the latest analysis, to seeds that originated in northern Africa (and not sprouts, as originally thought). What is also making such testing now feasible by food companies, is that test kits are now being manufactured and made available that can test for many of the known E.Coli strains. DuPont is one company making such test kits -- thanks! Corporations need to realize that safety and the quality of their products should be paramount because once a reputation is lost, it is extremely difficult to recover it. Also, the products may be consumed by those you know well and love. Who would think that a potential traffic jam, which is being called Carmageddon, would be getting so much attention nationally? Since I teach transportation & logistics, among other subjects, traffic fascinates me (as it does my students). 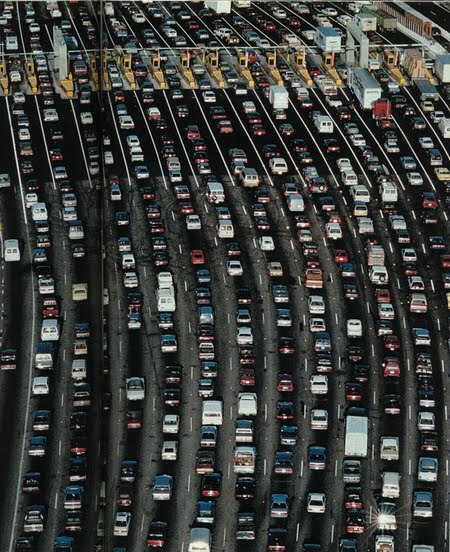 Carmageddon was to take place (and still might over the weekend) in Los Angeles, where a ten mile stretch of Route 405, which carries about 500,000 vehicles a day is closed to traffic for a 53 hour stretch, beginning last night at midnight. The reason for the closure is a road improvement project, which includes the demolition of a bridge. This event, which has begun smoothly, is being covered even by The New York Times, in an article written by Adam Nagourney (can't help but like the name) and Ian Lovett. I have been following what has been happening on the Los Angeles Times website. Clearly, the government provided sufficient warnings (over three months) about this closure and construction. Moreover, since it is taking place over the weekend, people have more flexibility and many can elect not to travel (in transportation, we would say that this is an elastic demand problem, as opposed to a fixed demand problem). I am curious to see what will happen tonight when there are many events in LA as well as early Monday morning, if the project does not get completed, and when people have to go to work. An update to this story on Monday -- the work got finished a day ahead of time -- thanks to the public listening and all the warnings and good planning; see this article. Who can forget the biggest traffic jam ever that took place last year, outside of Beijing, on the Beijing-Tibet "Expressway." That was a 60 mile, 9 day traffic jam -- just imagine having this experience! One group of my terrific students last Fall, who have since graduated, did a project on that traffic jam, possible reasons for it happening, and possible solutions for the future. You can access the slides of their presentation here. My doctoral student, Amir Masoumi, and I have been deeply researching blood supply chains, a supply chain of a highly perishable product, with life-saving properties. 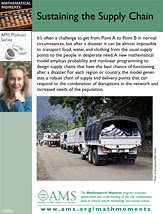 What makes the modeling and analysis of this health care supply chain so challenging is not only its perishability, but also that there is risk associated with its procurement (on bad weather days, for example, potential donors may decide not to give blood whereas during disasters there may be an outpouring of willing donors). The safety of the blood supply also requires proper testing and, at times, it may be difficult to predict the demand, resulting in shortages, for example, with associated costs. 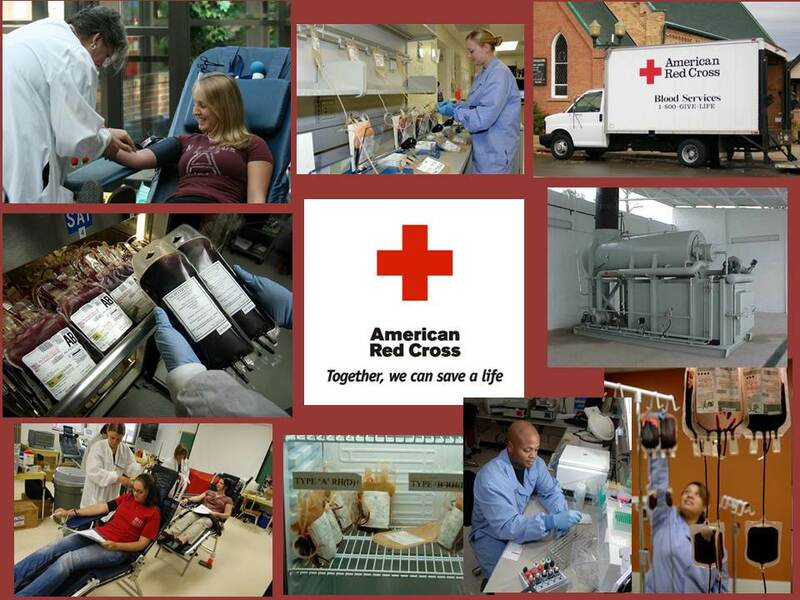 An oversupply of blood, on the other hand, requires proper waste disposal of outdated blood. There is now a blood supply shortage gripping the United States. 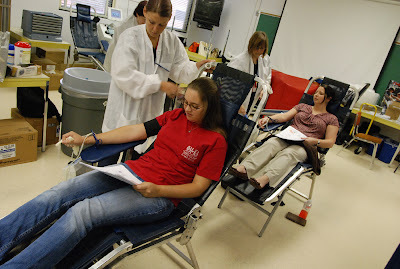 As noted in the Herald, under federal law, whole blood can be stored for up to 42 days. However, some studies have found that patients who receive blood stored even for a couple of weeks are more likely to suffer infections, cardiovascular problems and even organ failure, particularly those who use several units of older blood. A new paper, published yesterday in the journal Critical Care Medicine, explaining why this is so -- found that stored red blood cells begin to lose the ability to release a key molecule called adenosine-5’-triphosphate (ATP), which helps prevent the cell from sticking to the walls of blood vessels. 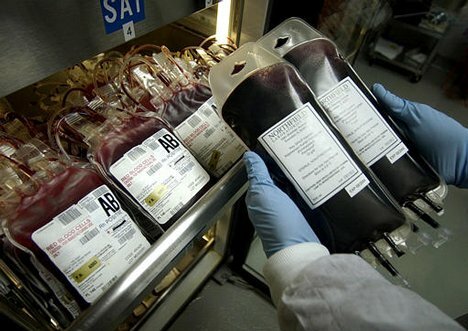 However, before researchers determine how to boost levels of ATP in older blood to make such blood safer, it is important to be able to analyze the risk and perishability of blood in its complete supply chain along with the costs which must include potential unmet demand as well as waste. We now have two papers on this subject, the first, Supply Chain Network Operations Management of a Blood Banking System with Cost and Risk Minimization, Anna Nagurney, Amir H. Masoumi, and Min Yu, focuses on optimizing the operations of the blood supply chain, whereas the second, Supply Chain Network Design of a Sustainable Blood Banking System, Anna Nagurney and Amir H. Masoumi, to appear in Sustainable Supply Chains: Models, Methods and Public Policy Implications, T. Boone, V. Jayaraman, and R. Ganeshan, Editors, Springer, London, England, 2011, in press, demonstrates how to design (or redesign the blood supply chain). By doing out best to optimize this life-saving, scarce resource, in a holistic manner, we can save lives. Interestingly, health care facilities in the United States are second only to the food industry in producing waste, generating more than 6,600 tons per day, and more than 4 billion pounds annually. In addition, considerable amounts of drugs have been found in 41 million Americans' drinking water due to the improper disposal of unused or expired drugs placed in domestic trash or discarded in the waste water. In other countries, up to 4 pounds of waste per hospital bed per day is produced, out of which 0.5 percent might be categorized as risky / potentially hazardous waste. Medical waste, also known as clinical waste, refers to the waste products that can not be considered as general waste, and that is produced, typically, at health care premises, including hospitals, clinics, and labs. Due to the potentially hazardous nature of medical waste, both the American Dental Association (ADA) and the Centers for Disease Control (CDC) recommend that medical waste be removed in accordance with regulations. Disposal of medical waste is not only costly to the health care industry, but also may harm the environment. Consequently, poor management of such waste may lead to the contamination of water, the soil, and the atmosphere. While many hospitals choose to have their waste burned so as to avoid polluting the soil through landfills, the incinerators themselves are one of the nation's leading sources of toxic pollutants such as dioxins and mercury. Thus, minimizing the amount of medical waste throughout the health care supply chains will lead to a cleaner environment, which may, in turn, also reduce illnesses and death. When it comes to blood supply chains, the scarcity and vitalness of this highly perishable health care product make such supply chains crucial. Hence, the effective design and control of such systems can support the health and well-being of populations and can also positively affect the sustainability of the environment by reducing the associated waste. 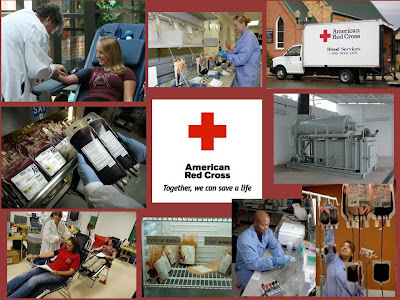 Indeed, since blood waste is a significant hazard to the environment, a major step in attaining a sustainable blood supply chain is to be able to minimize the outdating of blood products while satisfying the demand. In our paper, "Supply Chain Network Design of a Sustainable Blood Banking System," Anna Nagurney and Amir H. Masoumi, we developed a multicriteria system-optimization framework for the supply chain network design of a sustainable blood banking system. The framework allows for the simultaneous determination of optimal link capacities through investments, and the flows on various links, which correspond to such application-based supply chain network activities as: blood collection, the shipment of collected blood, its testing and processing, its storage, its shipment to distribution centers, and, finally, to the points of demand. The system-optimization approach is believed to be mandated for critical supplies in that the demand for such products must be satisfied as closely as possible at minimal total cost. 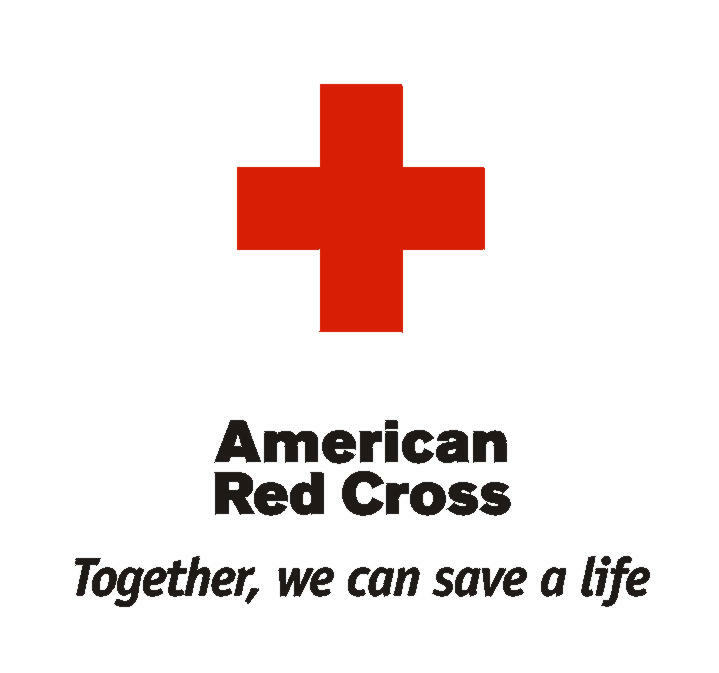 The use of a profit maximization criterion is not appropriate for an organization such as, for example, the American Red Cross, due to its non-profit status. 4. it allows for total cost minimization and the total risk minimization associated with the design and operation of the blood banking supply chain network. Our framework is a contribution to the growing literature on sustainable supply chains and to the design of sustainable supply chains, in particular (cf. Nagurney and Nagurney (2010) and the references therein). However, our supply chain network design model for sustainable blood systems focuses not on the minimization of emissions but rather on the minimization of waste. Moreover, it captures the perishability of this product. 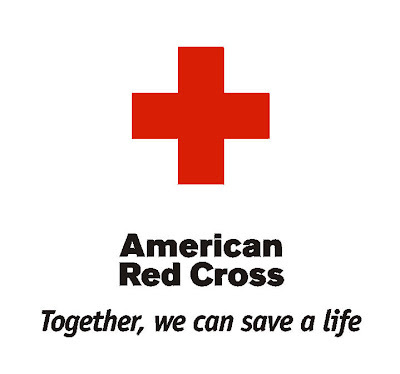 We thank the Red Cross for helpful discussions conducted by Amir H. Masoumi as we conducted this research. Our paper is now in press in the Springer International Series in Operations Research & Management Science, entitled: Sustainable Supply Chains: Models, Methods and Public Policy Implications, T. Boone, V. Jayaraman, and R. Ganeshan. Congratulations to the Winners of the Google Global Science Fair -- All Girls! The results are now in and congratulations are in order. The winners of the Google Global Science Fair 2011 are not only all from the US but they all are girls. You can read about their respective projects on ovarian cancer and drug resistance, environmental pollution, grilled chicken and PHPs on the competition website. The prizes that they have won are pretty fantastic. The three were selected from a pool of 7,500 entries from 91 countries! The New York Times has an article on the competition and the results. Information about the Integrated Risk Management in Operations and Global Supply Chains (INTRIM) Conference that will take place at McGill University in Montreal, Canada is now online. This conference has no parallel sessions so the audience hears all of the talks together, which is a plus, and there is ample time for discussion. 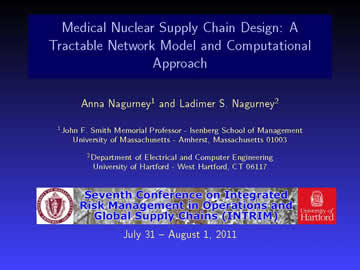 I am very much looking forward to this focused conference at which I will be presenting our latest paper, Medical Nuclear Supply Chain Design: A Tractable Network Model and Computational Approach, co-authored with the "other" Professor Nagurney. Recently, we also co-authored an Op-Ed piece, Viewpoint: Passage of American Medical Isotope Production Act of 2011 will help ensure U.S. nuclear medicine supply chain, which focused on the vulnerability of our medical nuclear supply chains. It is important not only to do research but also to speak about it at conferences and at other forums. There are also topics that one may feel sufficiently passionate about and may wish to disseminate thoughts, ideas, and even research results on to a broader audience. Hence, it is also important for academics to contribute OpEd pieces to newspapers on timely topics. Medical nuclear supply chains, which impact our healthcare security, are such a topic and their vulnerability needs to be addressed. There is some movement in the US Congress in this direction but the criticality of such supply chains, which enable both cardiac and cancer diagnostics, needs to be emphasized. Our OpEd piece on the subject: Viewpoint: Passage of American Medical Isotope Production Act of 2011 will help ensure U.S. nuclear medicine supply chain, was published in today's Springfield Republican newspaper, and may be read here. We have begun to conduct serious research on the design and redesign of medical nuclear supply chains. Our first study on the subject can be accessed, in pdf format, here. In 1997, I co-authored the book, Financial Networks: Statics and Dynamics, with Stavros Siokos, a former PhD student of mine, who has had a meteoric career in finance. Since that book, my students, collaborators, and I have conducted a lot of research on this topic, and have advanced the state-of-the-art to include electronic finance within a network framework, financial networks with intermediation, financial risk and node and link vulnerability, and even the integration of financial networks with social networks. Speaking of the reality of social networks and financial networks, The New York Times has announced that the Deutsche Bank will be announcing its new leader this weekend, and, of the finalists. is Anshu Jain. Jain received an MBA from our School of Management at UMass Amherst (which I had mentioned in an earlier blogpost). Plus, I heard today from one of my former colleagues at the Isenberg School of Management, Sheila Bair, who recently stepped down as the Chairwoman of the FDIC in Washington DC, and whose headship and leadership of that agency for 5 years has been heavily covered and lauded in the press. As of September 2011, she will begin her new position at The Pew Charitable Trusts in Washington DC. You can read the interview with Ms. Bair conducted by Joe Nocera of The Times here. I had the pleasure of being interviewed recently by Mr. Michael Breen of the American Mathematical Society (AMS) for the series Mathematical Moments. Mr. Breen had attended my presentation at the American Association of the Advancement of Science (AAAS) meeting last February in Washington DC. I had the honor of speaking on the Mathematics and Collective Behavior panel that was organized by Dr. Warren Page. The interview is on Sustaining the Supply Chain and focuses on the research of my team on humanitarian logistics and disaster management. The interview is now featured on the AMS website, along with an accompanying poster. The Isenberg School has made a note of the podcast on its homepage. The series Mathematical Moments highlights, in a graphic and informative way, the myriad ways in which mathematics illuminates our world and contributes to society. Plus, through such a series, one can engage others, including students, as well as the public, on timely topics. You may find information on our relevant publications here. Some of the outcomes of the workshop on Humanitarian Logistics:Networks for Africa, funded through the Rockefeller Foundation's Bellagio Center Program, and that I organized, which I noted in the podcast interview, can be found on a companion website. This summer, besides doing research, preparing a new course, working with my students, and speaking at conferences, among other professional activities, I have been busy evaluating packets for promotions, and also for tenure. This is a very important task and when I get a request from an outside university or college to evaluate a record of an academic, I devote a substantial amount of time to reading and rereading the publications, assessing the teaching and research statements provided, as well as the supplementary materials, etc. Sometimes the reviews are anonymous in that the candidate being evaluated has no idea that I am writing a letter of evaluation whereas other times I have been approached by a candidate and asked whether I would be willing to write a letter of support. Today, I received lots of wonderful news -- a female professor from a southern university that I had written a letter for sent me a thank you for my letter -- she got promoted to Full Professor. Also, today, UMass Amherst announced its promotions to Associate Professor (from Assistant Professor) and the awarding of tenure (which means your job is secure, which is very important for academics so that they can speak openly and pursue knowledge without restrictions). In the announcement of 31 faculty awarded tenure were 3 who had spoken, in different semesters, in our UMass Amherst INFORMS Speakers Series. They are: my departmental colleague, Dr. Mila Sherman, of the Finance side, Dr. Kevin Fu of Computer Science (CS), who is the UMass rep to the I3P consortium, with me as the alternate, Dr. Daiheng Ni of Civil and Environmental Engineering, who is one of my transportation colleagues (I hold a courtesy appt. in that department). Also, on the list is another colleague of mine from CS with whom I had co-authored a grant -- Dr. Gerome Miklau. Congratulations to these and to all the faculty on the list! This is a terrific group of faculty. 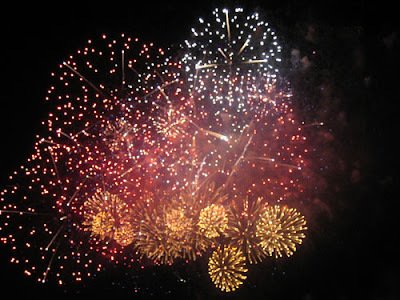 In honor of these faculty members, and, as a token of congratulations, I have included the above celebratory fireworks photo in this blogpost. Besides, the fireworks are in the spirit of the July 4th holiday season. I came across an interesting presentation given to a pharmaceutical audience on medical nuclear supply chains in which my book, Supply Chain Network Economics, was cited. This topic very much intrigued me so I began to research it. Each day, 41,000 nuclear medical procedures are performed in the United States using Technetium-99m, a radioisotope obtained from the decay of Molybdenum-99. The Molybdenum is produced by irradiating primarily Highly Enriched Uranium (HEU) targets in research reactors. Surprisingly, for over two decades, no irradiation and subsequent Molybdenum processing has occurred in the United States. All of the Molybdenum necessary for our nuclear medical diagnostic procedures, which include diagnostics for two of the greatest killers, cancer and cardiac problems, comes from foreign sources. Since Molybdenum-99 has a half-life of only 66.7 hours, continuous production is needed to provide the supply for the medical procedures. Thus, the US is critically vulnerable to Molybdenum supply chain disruptions that could significantly affect our healthcare security and is completely at the mercy of foreign suppliers. Currently, about 60% of the supply of Molybdenum-99 (Mo-99) for the United States comes from a Canadian reactor, with the remainder coming from Western Europe, with its production taking place in Western Europe, the former Eastern-Bloc States, and South Africa. Worldwide, there are only 9 reactors used for the target irradiation and only 6 major processing plants. The shutdown of any of the reactors or processing plants, due to routine maintenance, upgrades, or, as occurred during 2009 and 2010, for emergency repairs, could significantly disrupt our Molybdenum supply and impact our medical facilities' abilities to perform the necessary imaging for cardiac and cancer diagnoses. The number of processors that supply the global market, however, is only four, and they are located in Canada, Belgium, The Netherlands, and South Africa. Australia and Argentina produce bulk for their domestic markets but are expected to be exporting smaller amounts in the future. 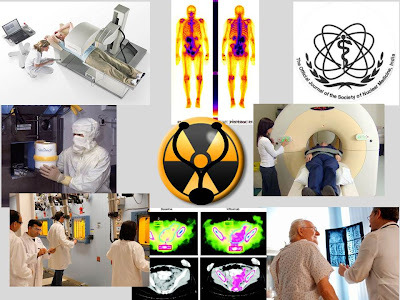 Limitations in processing capabilities restrict the ability to produce the medical radioisotopes from regional reactors since long-distance transportation of the product raises safety and security risks, and also results in greater decay of the product. The number of generator manufacturers, in turn, with substantial processing capabilities, is under a dozen. In addition, several of the reactors currently used, including the Canadian one, are due to be retired by the end of this decade, with the majority of them being between 40 and 50 years of age. Moreover, although most of the current production of Mo-99 uses HEU targets, all producing countries, where economically and technologically feasible, have agreed, in principle, to convert to low enriched uranium (LEU) according to the latest OECD Nuclear Energy Agency (2011) report. However, although the use of LEU targets for Mo-99 production has advantages over HEU, with proliferation resistance (and, hence, enhanced global security) being a primary one, along with easier availability of the target material and also easier compliance for its transportation and processing, the negatives, nonetheless, include: a lower production yield than HEU and a greater number of targets needed to be irradiated with associated increased volumes of waste. Hence, both production and processing pressures are raised as well as waste management issues. Since Mo-99 decays with a 66.7 hour half-life, approximately 99.9% of the atoms decay in 27.5 days, making its production, transportation, and processing all extremely time-sensitive. In fact, its production is quantified in Six-day curies end of processing denoting the activity of the sample 6 days after it was irradiated to highlight this. In addition to the time-sensitivity, the irradiated targets are highly radioactive, significantly constraining transportation options between the reactor and the processing facilities to only trucks that can transport the heavily shielded transportation containers. While the extracted M0-99 continues to be constrained by its decay, its shielding requirements are reduced, allowing for transportation by modes other than trucks, including by air. 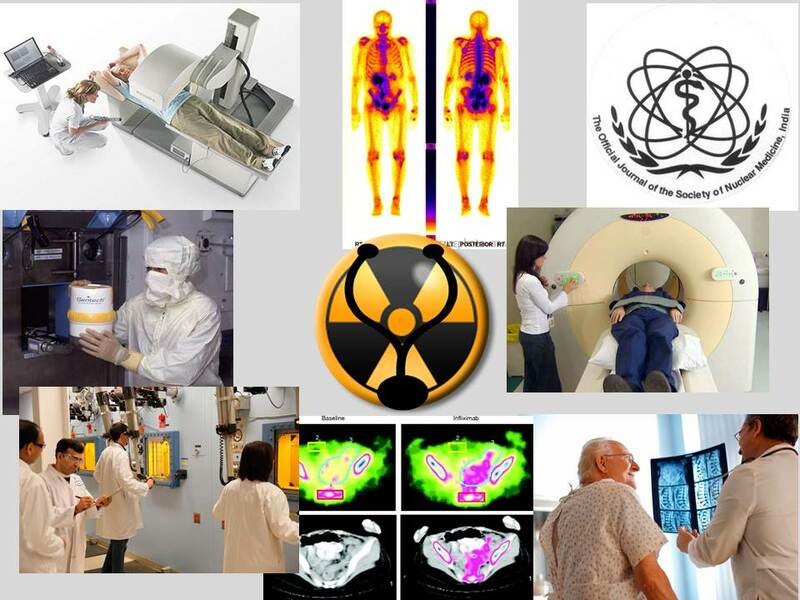 We began to identify what a rigorous medical nuclear supply chain network model for this radioisotope should include. For example, a proper model of this critical medical nuclear supply chain, which allows for appropriate economic cost quantification, heavily emphasized by policy-makers, must include the physics-based principles of the underlying radioactivity, and must incorporate multicriteria decision-making and optimization to capture the operational and waste management costs as well as risk management, subject to constraints of demand satisfaction at the hospitals and medical facilities. Moreover, it must be sufficiently flexible and robust in order to provide rigorous solutions as the technological landscape changes. Furthermore, it should enable the redesign of the supply chain network. With the creation of such a medical nuclear supply chain network economic optimization model, decision-makers, policy-makers, as well as, healthcare providers, would have the ability to analyze the medical nuclear supply chain vulnerabilities, and synergies, as well as to explore the relevant costs and risks. In addition, the effects on costs and risks of changes in demand, which is expected to increase given the aging population, could be assessed. Moreover, the various stakeholders including the government, the medical firms, and the hospital and imaging facilities, through such a supply chain network economic optimization model, could determine the true costs of operating the reactors, and the same holds for the processing facilities, as well as the generator manufacturing facilities. Such a transparent framework would enhance healthcare security, would allow for more accurate pricing and cost recovery, and would enable the evaluation of disruptions to the medical nuclear supply chain. This paper, I co-authored with my husband, Professor Ladimer S. Nagurney, who holds a PhD in physics, so it represents a true meeting of physics and operations research. I will be presenting this paper later this month at the Seventh Conference on Integrated Risk Management in Operations and Global Supply Chains. This year, this conference is being hosted by the Desautels Faculty of Management at McGill University, in Montreal, Canada, July 31st - August 1st, 2011. The goal of the conference is to bring together leading academic researchers and practitioners whose work strives to meet at the intersection of Finance, Economics, Operations, and Supply Chain Management. The conference web site is http://intrimatmcgill.wordpress.com. According to the conference announcement, this two-day conference will feature a single track of presentations that combine technical presentations, industry practices, and discussions on relevant challenges and approaches in the topic area. There will be sixteen 90-minute sessions. Each session has two 30-minute presentations, followed by a discussant giving an overview of related research as well as facilitating a discussion with session participants. The format aims to stimulate discussion and interaction among speakers and participants. I am very much looking forward to this conference and to presenting our work on medical nuclear supply chains. Parades are fun not only because of the marchers that you get to see but also because, especially in a small town, you may come across quite a few spectators that you know. In Amherst, since it is a college town, one always runs into some faculty, students, and even a dean. The Amherst, MA 4th of July parade that took place today is highlighted in the photos above. To all those who work so hard at their craft, sport, studies, jobs, and even research -- if you hang in there long enough and work hard enough, the recognition will come -- although it may come when you don't even expect it. What is important is that you stay with your passion, despite the obstacles that may block your way, and that you never stop believing in yourself. Last weekend, we were at the ISI (Ice Skating Institute) district / regional figure skating competition in Norwich, Connecticut, which covers all of the New England States. Our daughter was competing in three different events. The Norwich skating rink is located right next to a golf course and is in a lovely location in southeastern Connecticut. The competition took place June 23-26, 2011. Our daughter was very much looking forward to skating at this competition and her events were scheduled over two different days. She had her dresses/costumes packed up and had been training for months, while holding down a heavy set of academic subjects in school and also being on the varsity track team. Interestingly, there were decorations throughout the rink with a Chinese theme (consisting of lanterns, Chinese sayings, and graphics of what the various Chinese years mean, i.e., the year of the dog, horse, etc. ), so we interpreted these as good luck signs. The organizers of this competition did a superb job of making the events run in a timely manner (something that I very much care about) and created a warm and welcoming atmosphere. The results are posted here. Behind every achiever, there stand the coaches and the support network (family members, friends, and the community at-large) and special thanks go to them! The Daily Hampshire Gazette has a nice feature article recognizing the accomplishments and notes our daughter's truly exceptional figure skating coach, who makes skating, learning, growing, and doing one's best, such fun. I thought that, since I am a professor and have taught at universities both in the US (Brown, UMass, MIT, and Harvard Exec Education) and in Europe (Sweden and Austria), going on college tours would not be especially illuminating. As a parent, the great college tour has become another "On the Road" set of new experiences with my daughter, who is a rising senior. Although she has lived in different countries and has been to more conferences than some academics, she, nevertheless, and wisely so, wanted to see a spectrum of colleges before she decides which ones to apply to. Luckily, Amherst, where we live, is within 5 hours of driving to numerous colleges and universities and my daughter is very organized and efficient and plans on which days we will visit which colleges, using concepts that she has naturally absorbed from optimization and operations research. Seeing colleges and going on college tours, one gets a perspective that one doesn't obtain from just being an invited speaker at a college or a conference and these road trips and college tours have been fascinating learning experiences for us and also filled with adventures and colorful memories. I have also spent, even as a professor, substantial time living in college dorm rooms (Cornell's and Syracuse's among them) since I have been heavily involved in high performance computing and would attend summers courses/training sessions at various universities. We have done the Boston / Cambridge set of tours (many contrasting experiences) and most recently came back from visiting colleges in mid-state New York, where for miles we never saw any cars but did see (in addition to the signs) several horse and buggies driven by Amish with milk containers (they waved and smiled). We have listened to outstanding admissions officers who clearly know their institutions and who are passionate about them. After some of the most comfortable beds we have ever slept in (at the Holiday Inn in Ithaca) we were awoken the other night at 2AM to a resounding smoke alarm and managed to evacuate from our 8th floor rooms to see some guests outside fully dressed and others just wrapped in towels. The firemen seemed to take a while to arrive but ultimately everything was cleared and we marched back up the stairs. We also met other families who were either on college tours or on college orientations (including one lovely family from Oklahoma who had been delayed for 8 hours in Detroit trying to make their way to Ithaca and had arrived at the hotel only at midnight). As for those student college tour guides who manage to walk backwards throughout the one hour tour -- never missing a beat or spraining an ankle -- thanks for the enthusiasm and all the great stories! Also, thanks to the Admission Offices and staff who offer families cups of coffee (one even offered hot chocolate) and water. And to the college that offered us (my daughter accepted) ice cream sandwiches with chocolate chip cookies even before lunch -- thanks for such a welcoming and personal touch. What has impressed me about some of the various colleges that we have visited is the flexibility in terms of majors and the variety and the exciting international programs that are offered. As a parent, I also notice the quality of the infrastructure, including the classroom buildings and the libraries, as well as to how well the buildings are maintained and how pleasant the libraries and the cafeterias are (and what their operating hours are). I also always ask about safety and about health services -- would you believe that some colleges actually even delivered chicken soup to sick students? As for some of the dorm rooms that we have seen -- from the ones that so pleasantly surprised us to one the other day that reminded me of some of the photos I had seen in The New York Times of overcrowded prisons in California -- they are forever etched in our memories.